China calls them the Diaoyutai, Japan the Senkaku. In both languages, the name means "fishing islands," but these days the rocky, uninhabited islands are better known for discord. Over the past week, the pattern has repeated itself as ties between Japan and China have grown strained over a Sept. 7 collision between a Chinese fishing boat and two Japanese coast guard vessels near the disputed Pacific islands. Japan's coast guard released the 14-member crew on Monday, China's state-run Xinhua news service reported, but captain Zhan Qixiong and the boat remain in Japanese custody. While Japan maintains that it is handling the situation according to its laws, China has denounced Japanese plans to investigate the collision. Beijing Foreign Ministry spokeswoman Jiang Yu said on Sept. 9 that "Japan's so-called evidence-taking is illegal, invalid and in vain." The Chinese government summoned the Japanese ambassador, Uichiro Niwa, on Sept. 12 for the fourth time since the collision. The ambassador met with state councilor Dai Bingguo, the highest-ranking Chinese official so far to protest the handling of the incident with the Japanese government. Dai told the ambassador that Japan should find a "wise political resolution," according to Chinese state press. Japan took control of the islands, which are northeast of Taiwan, after the Sino-Japanese war of 1895 and has administered them since the 1970s, when the U.S. ended its postWorld War II control. But China has reiterated claims going back several centuries to when the location of the islands was first recorded. Taiwan also lays claim to the islands. Since the latest dispute, China has postponed a meeting with Japan aimed at resolving overlapping claims to natural-gas deposits in the area. The potential for vast oil and gas reserves near the uninhabited islands is a key source of the conflict over them. The 1982 U.N. Convention on the Law of the Sea offers conflicting instructions as to who is entitled to energy rights in the region, giving both sides a claim based on how they define their exclusive economic zones. China argues that its zone extends to the edge of the continental shelf, while Japan says that it should stop at the midpoint between the two nations. So far the Chinese government has played up its response to the incident, and state-run media outlets have provided detailed coverage. 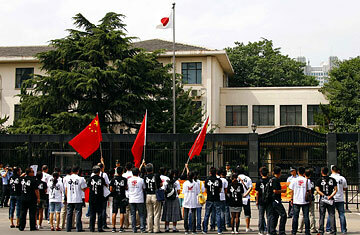 Chinese protesters held a brief demonstration outside the Japanese embassy in Beijing on Wednesday. Their event was small and subdued, nothing like in 2005, when anger over Japanese textbook revisions led to huge demonstrations across China and attempts by protesters to storm the Japanese embassy in Beijing. The authorities are clearly wary of a repeat of that unrest, and a large police presence remains outside the embassy. The collision near the islands is one of several territorial issues that have rankled the Chinese government this summer. During a July forum in Hanoi, U.S. Secretary of State Hillary Clinton said the U.S. would be willing to help mediate conflicting claims over islands in the South China Sea. That provoked a sharp response from Chinese officials, who had previously labeled sovereignty over the islands a "core issue" and said the disputes over them among China and Southeast Asian nations could be settled without outside intervention. The Chinese military has also complained about the naval drills held by the U.S. and South Korea in waters east of the Korean peninsula in July as well as the plans for another joint exercise closer to China in the Yellow Sea this month. An August commentary in the People's Liberation Army Daily, the Chinese military's chief mouthpiece, accused the U.S. of ignoring China's security fears by holding the exercises at its doorstep. The U.S. and South Korea responded that the war games were targeted at North Korea, which they blame for the sinking of a South Korean warship in March. Disputes between China and Japan over the islands have cropped up repeatedly in recent years. In 2004, seven Chinese demonstrators were arrested by Japanese authorities after landing on the islands, and in 2006 a group from Hong Kong were turned away at sea by the Japanese coast guard. Activists in Taiwan and Hong Kong declared over the weekend that they planned to sail for the islands. China's Foreign Ministry announced on Sept. 9 that a converted warship that now serves as a fisheries-enforcement vessel had also been dispatched to ensure that its fishing boats are safe from Japanese intimidation. But like shoals in a storm, these islands seem to attract trouble.